System consists of 2 vertical bus bars and horizontal rows of heating elements fused to inside of glass, a control switch, an indicator light, and timer relay. The grid feed wire is connected to bus bar on driver’s side of window. Ground bus bar is on right side of vehicle. Timer/relay receives current from fuse block. A circuit breaker protects defogger circuit. 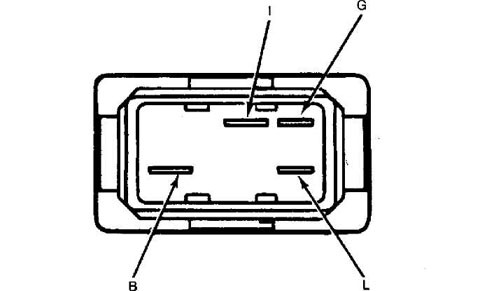 NOTE: On some Jeep models, defogger switch and electric tailgate switch are serviced as an assembly. Control switch testing is not available for Wrangler models. switch to "ON" position. Check for current at "I" and "B" terminals. With a good ground circuit and ignition switch in "ON"
ground. Test light should light. Turn defogger switch to "OFF" position. Test light should not light. of voltmeter. Contact driver’s side bus bar with positive lead. Turn ignition and control switches to "ON" position. Reading should be 10-14 volts. Lower voltage indicates a poor ground. midpoint and driver’s side bus bar line. voltage will change when break is crossed. On some Jeep models feed wire and ground wires a reversed. NOTE: No relay testing is available for Wrangler models. voltmeter to ground. Probe Red wire at relay with voltmeter positive lead. Battery voltage should be indicated. If no voltage is indicated, operate tailgate window. voltage should be indicated. Turn ignition switch to "ON" position. 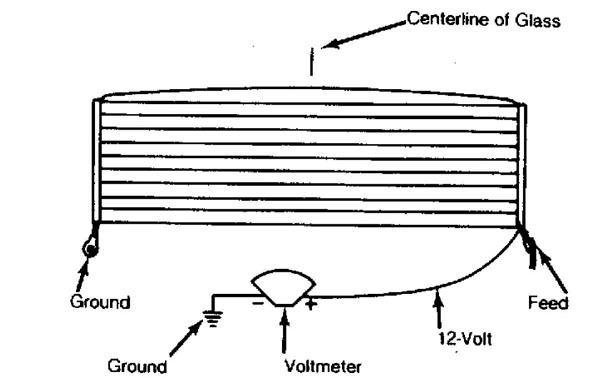 receiving voltage from Purple wire. wire to a 12-volt source in tailgate and probe Purple relay terminal.